The cold days of December beckon us to the kitchen to cook hearty dishes that will warm our bodies, and stave off winter’s chill. 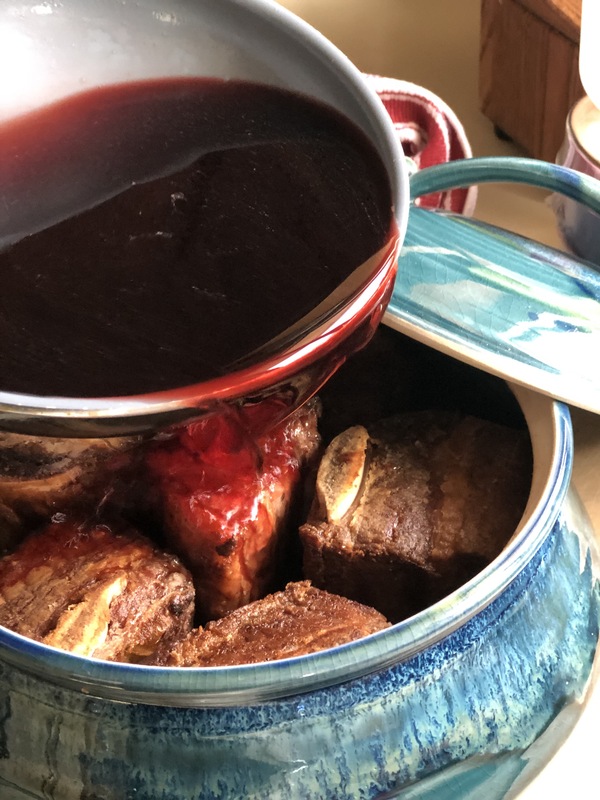 For me, the ultimate comfort food comes from braising meat low and slow in the oven for hours, filling my home with the soul satisfying essence of juices melding together as the meat reaches fall-off-the-bone tenderness. 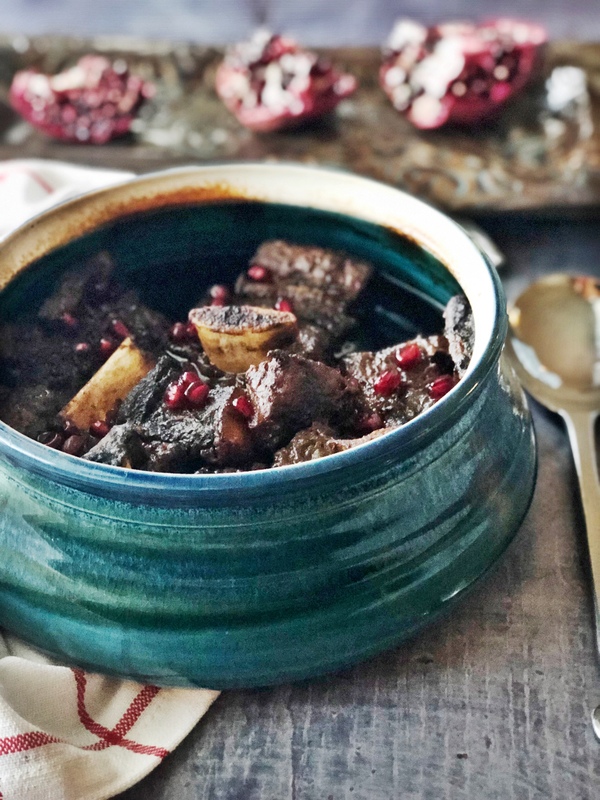 This festive recipe for beef short ribs hits the mark when I’ve got a “craving flung on me,” as my sister would say. It was inspired by a recipe from Jessica Merchant (How Sweet Eats) that I tweaked slightly to compensate for an ingredient I couldn’t find (pomegranate molasses). 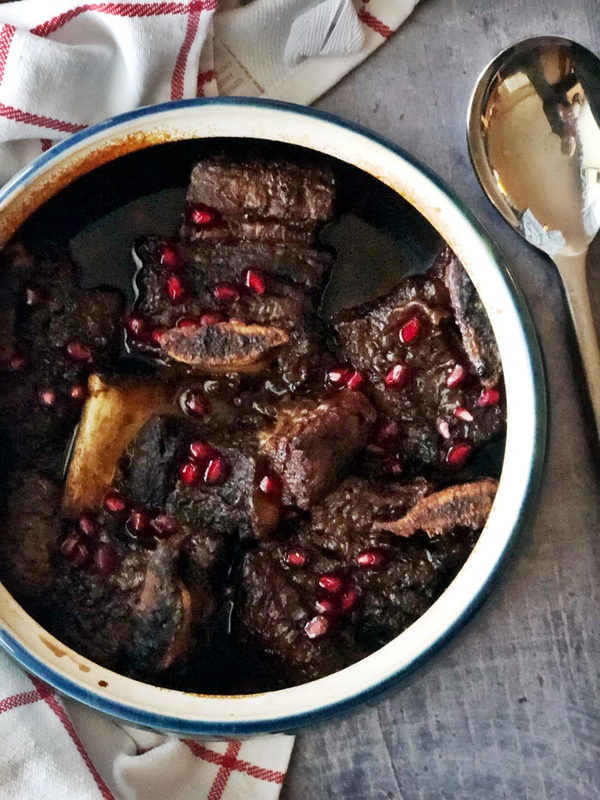 The ribs are browned in a skillet, then transferred to a dutch oven to bake in a base of pomegranate juice and pomegranate vinegar blended with a little dark brown sugar. As the juices reduce in the oven, you’re left with a delicious sweet-tart sauce that pairs well against the richness of the ribs. Since the quality of the meat really determines the success of the recipe, I highly recommend preparing this dish with grass fed and finished beef from Stemple Creek Ranch. 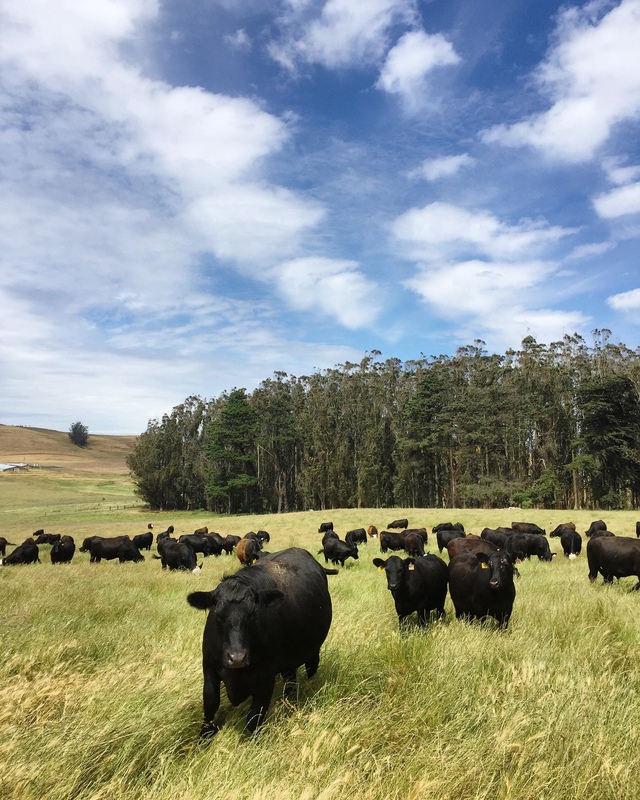 This fourth-generation family ranch in West Marin County grazes their animals from birth to harvest on wide open pastureland just five miles from the Pacific Ocean. In addition to a good life, owners Loren & Lisa Poncia are taking sustainability to the next level by using cutting edge carbon farming practices to manage their land, and reduce their carbon footprint. Theirs is a ranching model I’m happy to support with my spending dollars! You can buy their meats online through their webstore, or if you live in the Bay Area, you can visit their booth at the Sunday Marin Civic Center Farmers Market year round. Simple yet elegant, the finished braise is perfect for a family meal or holiday guests. 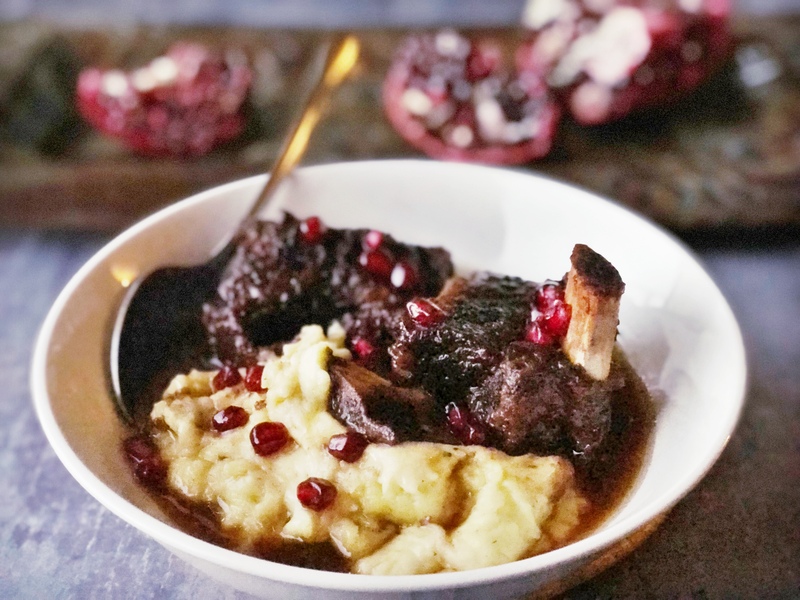 Serve each portion of short ribs in a bowl over creamy mashed potatoes with a few spoonfuls of the juices, a green salad, and a glass of good red wine. It’s a winter meal that’s utter perfection! 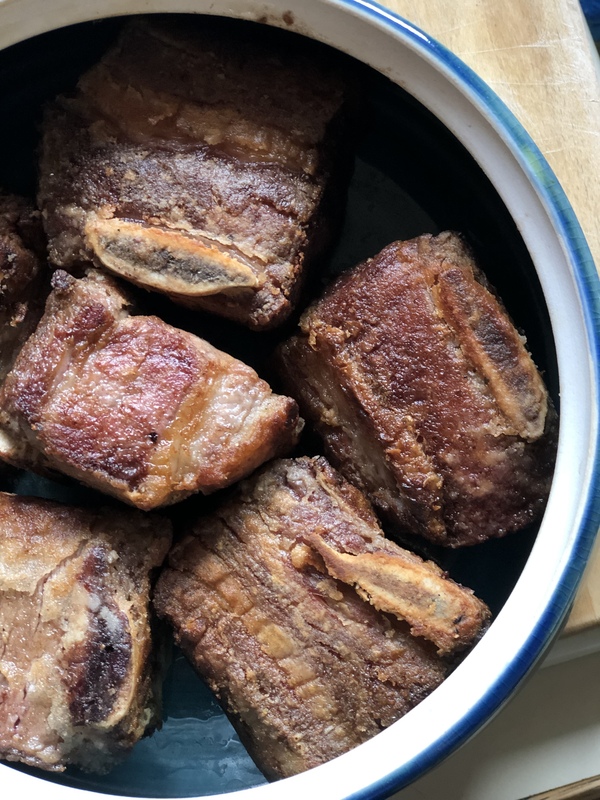 *you may skip the flour (or substitute rice flour) and brown the short ribs seasoned with salt and pepper for a gluten-free preparation. Combine the flour, salt and pepper in a large gallon-size ziplock bag. Add the short ribs, seal, and shake the bag to coat the meat with flour mixture. Heat the olive oil a large heavy skillet (preferably cast iron) on the stove over medium heat. Shake off any excess flour from each short rib, and place each rib in the hot oil. Sear on all sides until light golden brown (about a minute or two per side). Remove browned ribs from the pan and set aside. In a small sauce pan, combine the pomegranate juice, pomegranate vinegar and brown sugar over medium heat. Simmer and stir juice until the brown sugar melts. Remove pan from the heat and aside. 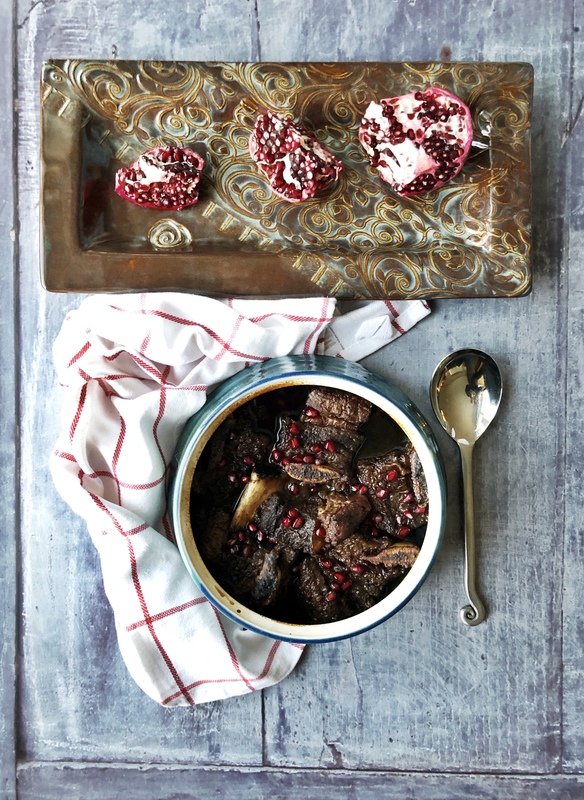 Place the browned short ribs in a dutch oven or ceramic casserole (with a lid). Pour the pomegranate juice mixture over the top of the ribs. Cover the dish with a lid and place on the center oven rack for 2 1/2 to 3 hours to braise. When done, the ribs should easily fall off the bone and the sauce will have thickened slightly. For each serving, place (2) short ribs in a bowl over mashed potatoes with several spoonfuls of the braising juices. Garnish with pomegranate seeds if desired. *Note: Refrigerate remaining ribs and juices overnight to allow excess fat to solidify. Remove fat solids before re-heating. This dish only gets better as the flavors meld. Looks amazing! Can’t wait to try it! Thanks, Karen!